Announcement Baby quilts and coordinating nursery decor, keepsake wedding quilts, commemorative tie pillows, throws, wall hangings, table runners, and small sewn gifts: we hope each of our creations makes your heart smile and makes you want to cozy up with the ones you love. Like us on Facebook for updates on our new projects and insider promotions, as well as ideas and inspiration for things you can make for your every day life! Baby quilts and coordinating nursery decor, keepsake wedding quilts, commemorative tie pillows, throws, wall hangings, table runners, and small sewn gifts: we hope each of our creations makes your heart smile and makes you want to cozy up with the ones you love. What a privilege to create a personalized label for a quilt made for a warrior battling breast cancer. Sunny skies and cheery purple fabrics under my needle. Happy Saturday! Looking for something extra special for a new baby? 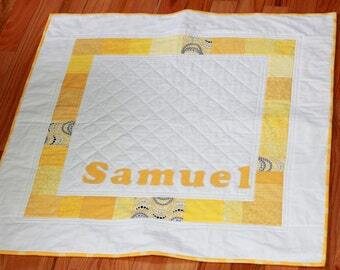 A custom quilt with the precious bundle's carefully chosen name could be the perfect gift! All sewn. Stray strings snipped. Next up, carefully packaging them up for shipment! These will bring such special memories in their new homes! Tie Pillow Covers Decorative Upcycled From Your Favorite Ties Free Shipping! Sentiment Quilts: capture your guests' memories, blessings, and wishes and save them in a quilt instead of a book! Twinkling lights on the Christmas tree, warmed by a handmade tree skirt designed to our customer's specifications. The beautiful, meandering lines of stipple quilting - an intricate finishing touch. Bold, traditional colors reminiscent of Amish quilts from our home state of Pennsylvania. Custom quilt, pennant, & crib skirt. Born of a pencil sketch by "Mom" and transformed into a complete nursery set! As an adoptive couple eagerly anticipating bringing home a baby girl in the fall of 2011, our plans changed dramatically when her brave mama decided to parent. Having quit my full-time job as a Bilingual Customer Care Team Leader, it was a good time to consider a new direction. We prayerfully decided to give it a go and to take my longtime hobby and my husband's eye for color to create stunning, bold, colorful keepsake quilts. It's rather symbolic of our life actually: taking pretty fabric, cutting it up into hundreds of little pieces that look like nothing by themselves, but then watching as they lovingly get put back together into something way more beautiful than we could have ever imagined. We're still watching our story unfold under the hand of the Master and are still getting a kick out of watching our quilts take shape in our home studio. And now we are designing and creating quilts while chasing our two beautiful children. We’re a husband and wife team that loves creating with color. Hubby is known in the quilt store as the “guy who matches the colors” (and he rocks it!) and then I take over and watch the magic unfold. Welcome to Sew Abundantly. We're so glad you're here. We're a husband and wife team committed to creating handmade, high-quality items that will add cozy touches to your home. Equally important is providing you with excellent customer service. We want you to have a completely positive experience from start to finish and will do everything possible to this end. If you have any questions at any time, please feel free to Convo us, and we'll be happy to help. We're committed to making sure you're completely satisfied with your purchase. If you have any questions before you're ready to buy, please ask and we'll be happy to do all we can to answer them for you. We'll accept returns of stock items within 30 days of purchase providing the item is clean, unused and in original condition. Unfortunately, shipping charges cannot be refunded, and you will be responsible for the cost of return shipping. Please contact us before returning any item so that all arrangements can be made. Since custom orders are made especially for you and to your exact specifications, we are unable to accept returns on custom items. We are happy to work with you every step of the way to make sure that you are comfortable with the design and creation process so your custom item will be exactly what you're looking for so no returns will be necessary. We are currently accepting payment via PayPal (including all major credit cards) and Etsy Checkout. We'll prepare your item for shipment as soon as the payment clears our account. PA residents: 6% sales tax will be applied to your order upon check out. All ready-made items are available for shipment within 2-4 business days after receipt of payment. Most orders will ship via Priority Mail for delivery within the United States within 2-3 days. International shipping is available, please contact us for rates and additional details. Insurance and even quicker delivery available upon request. Contact us for details and for a quote. We're always working on a new project, and are keeping super busy with our kiddos too. In this busy season of life, we are currently not accepting custom orders.